This is the central part of the triptych that is inspired by a visit of Bert to the former coal mine 'Zeche Zollverein' near Essen in Germany at the end of September 2017. Hundreds of coal mines produced coal in the Ruhr area, but only this one has been part of the UNESCO World Heritage since 2001. 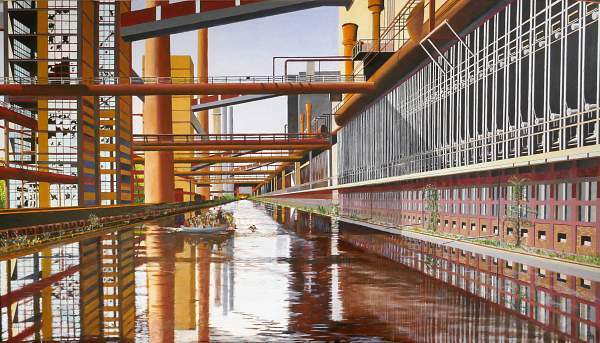 With good reason: the Zollverein Coal Mine is a masterpiece of industrial architecture, created by the visionaries Fritz Schupp and Martin Kremmer. The symmetrical arrangement of buildings is still impressive today: the facilities designed down to the last detail are a completely preserved synthesis of the arts. Until 1986, a total of 240 million tons of coal had been produced, up to 8,000 miners worked day and night above and underground. Today, the industrial monument is a dynamic cultural location with museums for industrial heritage and design.The famous pit head gear impressively represents the change of a whole region. About 1.5 million guests from all over the world meanwhile visit the site every year to experience the exceptional industrial architecture.